1. Identify those small important actions (like writing a loving message to the important people in your life). 2. Group them together into a routine with equally important actions. 3. Schedule a specific time each day to complete this routine. 4. Use a trigger as a reminder to complete this stack. 5. Make it super easy to get started. In essence, the goal here is to complete the habits that you know are important by stacking them on top of one another. Habit stacking works because you eliminate the stress of adding too many new things to your life. Instead, you begin with a few simple but effective habits and then build on them as this routine becomes an important “can’t miss” part of your day. This stack (and the others you build) will become as important as the routines you follow when you get up in the morning, prepare for work, and get ready to sleep. This is what I hope to teach you in this book, Habit Stacking: 127 Small Changes to Improve Your Health, Wealth, and Happiness. The purpose of this book is to help you identify the important small actions in your life and build them into your daily routine—without causing you to feel overwhelmed by this change. 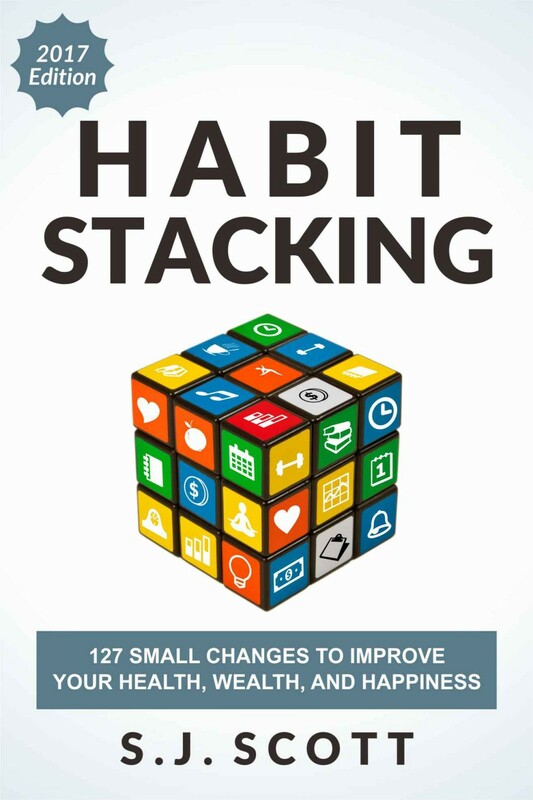 Part I is the current section you’re reading, which provides an overview of habit stacking and why small actions matter. Part II talks about goals. Specifically, why they are important, how to create ones that match what you want from life, and how they relate to the three types of habits we’ll cover in this book. Part III briefly covers the psychology behind habit stacking and how you can use it to remember all those small life-changing actions. Part IV shows you how to get started with habit stacking. Here, I provide nine rules for creating a stack and the thirteen-step process for building your first routine. Part V is the beginning of the seven sections that cover the 127 habits. We’ll start with career goals, which will focus on improving your productivity, increasing your business revenue, and implementing the habits that help you do better at your job. Part VI will cover the finance habits, which will include topics like saving for retirement, improving your credit score, eliminating your credit card debt, and investing to build long-term wealth. Part VII goes over the health habits that are important for maintaining a balance of physical fitness, eating the right foods, and practicing specific routines that ensure the safety of you and your family. Part IIX discusses the leisure habits that might not seem immediately important but are vital for improving the quality of your life. Part IX talks about the organizing habits that provide structure to your surroundings in a mindful way where you don’t feel overwhelmed by the “stuff” in your life. Part X will cover the relationship goals that help you enhance interactions with the important individuals in your life, while encouraging you to meet new people. Part XI includes spiritual habits, which covers a wide range of topics like meditation, prayer, yoga, helping others, or reciting affirmations. Part XII provides nine examples of habit stacks you can build and how to overcome the six challenges you might encounter when building a routine, and then we’ll wrap up the book. While you might feel tempted to skip ahead to the “good stuff” that starts in Part V, I recommend reading this book in sequential order. Each section builds on what you’ve learned in the previous one. That means that by the time you get to the description of the individual habits, you’ll be able to accurately choose the actions that have the biggest benefit for your life. Before getting started, let me introduce myself and tell you a brief story about the origin of the habit stacking concept. My name is Steve “S.J.” Scott. I run the blog Develop Good Habits, and I’m the author of a series of habit-related titles, all of which are available at HabitBooks.com. The purpose of my content is to show how continuous habit development can lead to a better life. Instead of lecturing you, I provide simple strategies that are easy to use no matter how busy you get during the day. My discovery of the habit stacking concept was a complete accident. It was inspired by a moment of utter frustration about a not-so-great situation and what I did to fix it. Let me explain. In 2012, I had been dating a wonderful woman (who is now my wife) for a year. We had a good relationship but also a challenging one because we lived almost two hours apart. Due to her job as a schoolteacher and my need to have a dedicated space for my business, our time together was limited. This meant we only saw each other on weekends and holidays. Now, if you’ve ever been in a long-distance relationship, you know that a lengthy time apart can be a major source of tension. You want to be with this person, but it’s not easy to make that happen. Often, this tension leads to disagreements, misunderstandings, and eventually arguments. Finally, we reached the point where we had to progress as a couple or break up. One day, we sat down and had an honest talk. I loved her and truly didn’t want the relationship to end. But we also realized that our interactions were far from perfect. Trust me, it was extremely hard to hear that bit of feedback. But it was also a light-bulb moment. It made me realize how little effort I was putting into nurturing our relationship during the workweek. Sure, there was an occasional phone call, but there were many days when we didn’t talk to each other. This statement made me realize that sometimes it’s the smallest of actions that can have the biggest impact on someone’s life. After truly hearing what my girlfriend was saying, I made the internal commitment to send her a nice text and phone call every day without fail. 1. Send one loving text message first thing in the morning. 2. Make time for a ten-minute phone call in the evening. Of course, all this sounds easy in theory. As strange as it sounds, I quickly realized that the most difficult thing to remember was sending that text message first thing in the morning. It took less than a minute to do, but it kept slipping my mind because I’d wake up each day with a to-do list full of “important” tasks. Eventually, I found a solution: I set a reminder on my phone that dinged during the first thirty minutes of my day. When the alarm went off, I would send a nice message. Real romantic, right? Fast forward a few weeks to the day when I had a random thought: Since I was already consistently completing a small, positive habit each morning, why couldn’t I add a few more to this routine? So, I decided to schedule a thirty-minute block of time into my day when I would complete a bunch of quick but important habits. These included making a nutritious shake, reviewing my goals, researching the market for my business, and jotting down the three priority tasks for the day. Each task took less than five minutes to do, yet they improved my life because they directly aligned with my important goals. In 2o14, I started talking about this concept on my blog (calling it habit stacking) and even published a book that showed others how they can incorporate this routine into their days. What hasn’t changed is my adherence to habit stacking. Sure, I’ve swapped out many actions, but I still start my day by completing a daily routine full of small tasks that directly relate to important goals. I’ll share more about this routine in Part IV, but for now, let’s talk about what’s different in this second edition, and then we’ll dive into the meat of the book. The book you’re reading is the second edition of Habit Stacking. I wrote the original back in April 2014, simply describing a routine that I personally enjoyed every day. 1. The habit stacking concept wasn’t explained fully enough. 2. Some small actions seemed overly simplistic. While I feel this routine has been valuable to me, I had to admit to myself that I didn’t do a thorough enough job describing how it can help others. All of this led to my decision to publish a revised version of the original book. Even if you’ve already read the first edition, I guarantee you’ll learn many new things in this updated second edition. Not only will you rediscover the benefits of habit stacking, you will also learn the most effective way to immediately implement this routine into your busy life. You’ll quickly notice that this book is chock-full of links to many resources, apps, and websites. They’re included here because they can help you implement the concepts mentioned in this book. If you’re someone who likes to leverage technology to build habits, then I recommend checking them out. That said, if you’re not really into apps, then feel free to ignore these suggestions. You’ll find that this book follows a “choose your own adventure” model where you use what you like and disregard the rest. Finally, you don’t have to write down resources mentioned in this book because all of them are also included on the companion website. Habit stacking has transformed my life. I no longer worry about when I’ll complete a small but important action. Instead, I identify the best time and then I add it to one of my existing stacks. This allows me to stay on top of my important goals without loading up my day full of annoying reminders. If you’re ready to build small actions that will transform your life, then read on to discover the power of habit stacking. To kick things off, we’re going to talk about the importance of setting goals and how to identify the right habits for you.